Winter is around the corner and now is the time to subscribe to the Madrona Grove Winter Produce Program. Your order will be packed with staple winter vegetables, fresh winter storage apples and pears and tropical and citrus fruits (because we all need our vitamin C in the depths of winter), plus other goodies like bread cheese and chocolate truffles from Washington food producers. 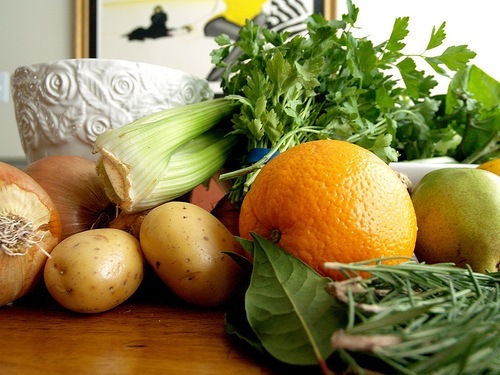 Staple winter vegetables include potatoes, garlic, onions, carrots, turnips, beets, parsnips, and fresh greens. Madrona Grove will continue to have fresh crisp storage apples and pears from Washington farmers throughout the winter, and you can order extra boxes of these now for pickup at the Apple Affair on October 30, or be satisfied with their inclusion in your subscription. They’ll continue to work with local producers to bring you eggs, greens, dried and canned fruit, cheese, baked goods and anything else that’s well produced and sounds delicious. You’ll need just a bit of adventuresome nature because the folks from Madrona Grove will be choosing and packing the order for you with an aim to give you a balanced, diverse selection of food items. Click here to download an order form to complete. Send it by mail to Madrona Grove, with your check for $312.50. That’s half of the subscription price of $625.00. For $125.00 per month you’ll receive yummy healthful food with the knowledge that 90% of those dollars are staying active in the local economies of our county and state. Thanks again for continuing to support small, sustainable agriculture and business, and the efforts of Madrona Grove to bring farm fresh food to our neighborhood. Posted in Building Earth Farm, Madrona Grove Fruit Truck.